The agile community has figured out how to build and then continually improve very high-performance software development teams. This is akin to creating a race car engine and then evolving it to get more power, better fuel efficiency, and greater speed. Sadly in many cases we take these great engines, put them into an organizational tractor, and then complain that we're not winning the race. What we need to do is take our great race car engines (our development teams), put them into a race car (a DevOps ecosystem), have a great pit crew and driver (an effective IT organization), and then provide somewhere to race (an organization that can leverage IT to make money). That's what this book is all about - Moving from optimizing team performance to optimizing the entire enterprise.Business agility - being an adaptive, lean, responsive, and learning organization - is the race that enterprises need to win today. Yet there is no quick fix, no silver bullet, to attain business agility. This is a multi-year journey requiring hard work, experimentation, and most importantly a willingness to improve. The Disciplined Agile framework lowers risks and provides a path to accelerate your journey to business agility. The framework is unique in that it is the only one that puts all the pieces together into a cohesive enterprise roadmap for business agility transformation.This book begins with an overview of the challenges and opportunities that organizations face. We then describe seven principles that provide the underpinnings of the Disciplined Agile framework. 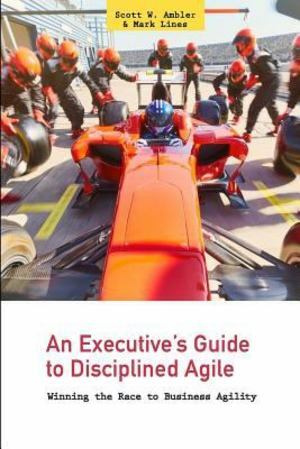 Then the book works through Disciplined Agile Delivery (how to build a world-class engine), Disciplined DevOps (the race car), Disciplined Agile IT (the race car and its team), and what it means to be a Disciplined Agile Enterprise (the racing business). The book ends with a plan for starting with an Agile transformation and then evolving into a long-term continuous improvement strategy.Do you have the discipline it takes to win the race to business agility?